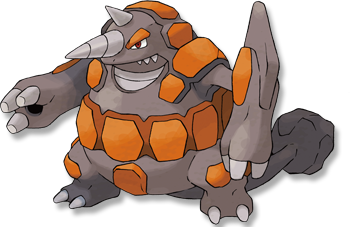 Solid Rock Powers down super-effective moves. This Pokemon takes less damage from super-effective moves. Reckless* Powers up moves that have recoil damage. Opposing Pokemon take 30% more damage from recoil. Not specified. Please report this problem to an Administrator. Diamond/Pearl It puts rocks in holes in its palms and uses its muscles to shoot them. GEODUDE are shot at rare times. Platinum It can launch a rock held in its hand like a missile by tightening then expanding muscles instantly. Heart Gold From holes in its palms, it fires out GEODUDE. Its carapace can withstand volcanic eruptions. Soul Silver From holes in its palms, it fires out GEODUDE. Its carapace can withstand volcanic eruptions. Black It can launch a rock held in its hand like a missile by tightening then expanding muscles instantly. White It can launch a rock held in its hand like a missile by tightening then expanding muscles instantly.